Msekiwa Matsimbe is not afraid to get her feet wet, whether mingling with a crowd of international policy leaders and experts in agricultural research for development or netting fish specimens in the rivers and lakes of her native Malawi. At age 27, she may be one of the younger faces in the crowd, but she has an enthusiasm for her work that inspires far more seasoned colleagues. “I want to increase women’s participation in aquaculture and fisheries to improve livelihoods in Malawi,” she says, adding, “Fish can supply the protein that women and children need to prevent diseases caused by protein-deficiency.” This is critical in a country like Malawi, which has one of the highest rates of mortality for children under age 5 in the world. Fish contribute more than 75 percent of people’s protein source in Malawi. Though landlocked, a quarter of the country is covered by aquatic ecosystems, and fishing plays a critical role in the economy. Fishing is the main livelihood for people residing along the shores of Lake Malawi, the 8th largest lake in the world. With over 800 varieties, Lake Malawi has the most diverse communities of freshwater fish species in the world, 95% of which are endemic. But sedimentation, contaminants, invasive plants, and overfishing are threatening the lake’s health, and its biodiversity. 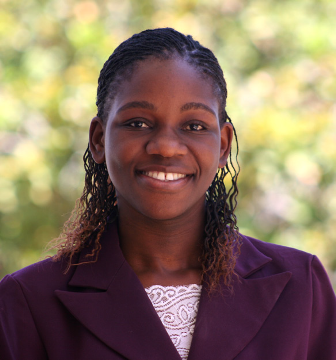 Matsimbe has conducted research for her MSc assessing the effects of land use and environmental changes on the diversity of fish in the rivers that feed into Lake Malawi. The work is especially important since the biodiversity of river fishes in Malawi has been little studied and is at risk. Results from the project will be used to inform a government management strategy to increase fish yields and help prevent overfishing. In addition, Matsimbe is conducting outreach work with fish farmers in the Dowa district, including women farmers. She is demonstrating the use of plastic sheeting on the growth of Oreochromis shiranus (a common fish) in earthen ponds. The technique is simple, affordable, and effective. It offers farmers a way to produce more fish for market and a sustainable source of protein for their families. Matsimbe’s interest in agricultural studies was sparked in secondary school by the visit of students from the College of Agriculture. It grew as she pursued her undergraduate studies. But it was her selection as a fellow with the African Women in Agricultural research and Development (AWARD) program that she says really strengthened her passion for agricultural research for development. AWARD is a 2-year professional development program that strengthens the research and leadership skills of African women in agricultural science. The fellowships are awarded on the basis of intellectual merit, leadership capacity, and the potential of the candidate’s research for improving the daily lives of smallholder farmers, especially women. Each AWARD fellow is paired with a mentor and offered leadership training and opportunities to participate in high-level international meetings. For Matsimbe, AWARD has thus strengthened both her capacity and her passion regarding agricultural research for development. It is helping her map out her career path, including pursuing a PhD to conduct further research on improving food security in Malawi. Thanks to AWARDS mentorship program, has won a first and a third prize in poster presentations at two international meetings and was sponsored to participate in the Second Global Conference on Agricultural Research for Development (GCARD) taking place in Punta del Este, Uruguay, October 29 – November 1. Matsimbe will be joining AWARD fellows, the program director, and other agricultural experts and leaders. Together, participants will be identifying how collective activities and innovations can transform the GCARD Roadmap for agricultural development into tangible actions that are relevant to the needs of sustainable development and produce positive impacts. Her participation in the Social Media Reporting training and the GCARD conference will turn Matsimbe into an ICT compliant social reporter for agriculture and fisheries. She also joins a cohort of young scientists in agricultural development sharing their input at CGARD, honing their skills, and sharpening their confidence to speak at a higher level and affect policy decisions. It is this kind of win-win combination of individual and institutional capacity strengthening that will be one of the central topics of GCARD. AWARD will be featured during a special session, not only for its success in empowering individual women scientists in Africa, but also for its contributions to broader scientific research systems and to improving the lives of smallholder farmers, a majority of whom are also women.